Boy Are We Spoiled! | ¡VidaMaz! Not only do we live on this gorgeous Bay of Mazatlán, with the huge variety of flora and fauna we enjoy every day, but we have locals who have left town to study, become experts, and return to give back to and enjoy fully of this wonderful community of ours. Such is the case with Oscar Guzón, a marine biologist from a local family who not only owns and operates Onca, but advocates tirelessly for the environmental well being and conservation of our port city and its beautiful bay. We were fortunate to meet Oscar shortly after having moved down here full time. I’ve written previously about Onca’s whale watching expeditions, which are by far the best I’ve experienced, East Coast or West, Europe or Asia. Passengers’ enjoyment of the whale watching experience is part of their larger effort to catalog and study the whales, their habits and migration patterns. 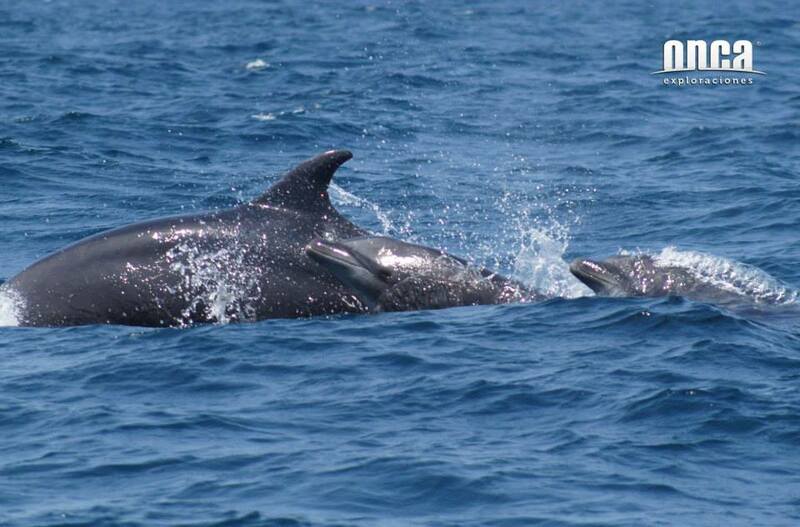 Well, Onca has added another marine mammal to their studies: the dolphin. Going out with Onca, you’ll learn about the dozens of species of this cetacean, and the fact that we have a huge percentage of those species right here in Mazatlán. Onca’s crew are doing for the dolphins what they’re doing for the whales: cataloguing, studying and tracking them, as part of larger efforts throughout the Sea of Cortes and points south. Their new “swim with the dolphins” program is not to be missed! We were completely surrounded by these amazing creatures, many times over. Now, maybe you can swim as fast as a dolphin, but I certainly can’t! First time in the water, I swam. Second time, I used a life preserver; it was much more enjoyable for me to just sort of float there among the gorgeous dolphins as they swam, frolicked and jumped around me. Trying to keep up with them was obviously not going to work! The Onca crew are consummate professionals, the boat and equipment top-knotch and safe. They don’t just provide a tour, they provide an education, and are committed to giving us the best experience possible: we swam, we snorkeled, they provided sandwiches and drinks, and they watched over us to keep us safe and happy. It’s beautiful to see how much they love and respect the wildlife as well as this gorgeous place in which we are fortunate to live. Thank you, Oscar, Belén, Saúl, and Michel. Here is a short video of our dolphin swim on Wednesday. PS: I’m not being paid or remunerated for this post. It’s just a whole lot of fun, and I want to let you all know. Just wondering if you knew anything about flights into Mazatlan? We always flew Cleveland to Houston to Mazatlan . Now flights are gone and few available. Do you know of good flights and is this due to a decrease of tourism there? We go to Playa Novillero an hour and a half south.